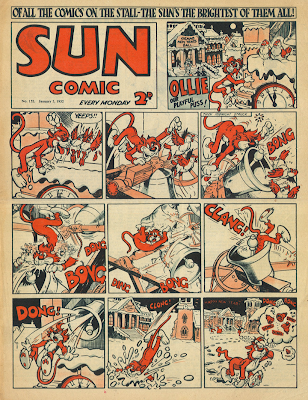 It's time to return to Sun comic in the second part of looking at it's constantly changing style. 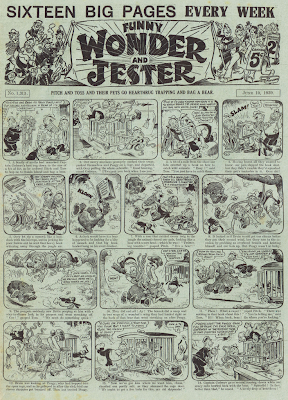 Last time we left off at #101 and as we can see below only a small number of issues later Alfred the Great had vanished from the cover. This is #130, but he had gone by at least #112. 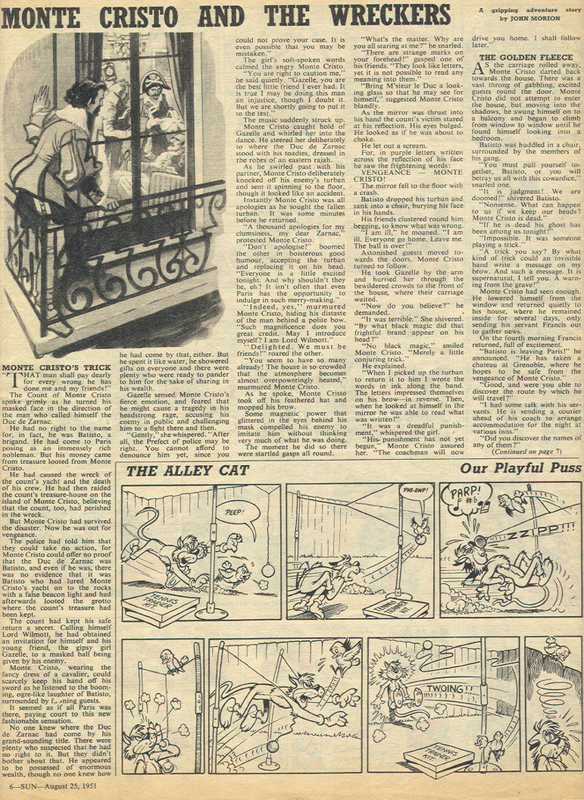 Here's a strip from inside that issue, called The Alley Cat. 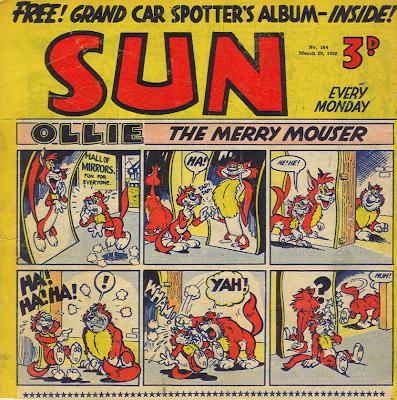 Only weeks later had he being christened "Ollie", and appeared on the front cover, under the new title of Ollie: Our Playful Puss! 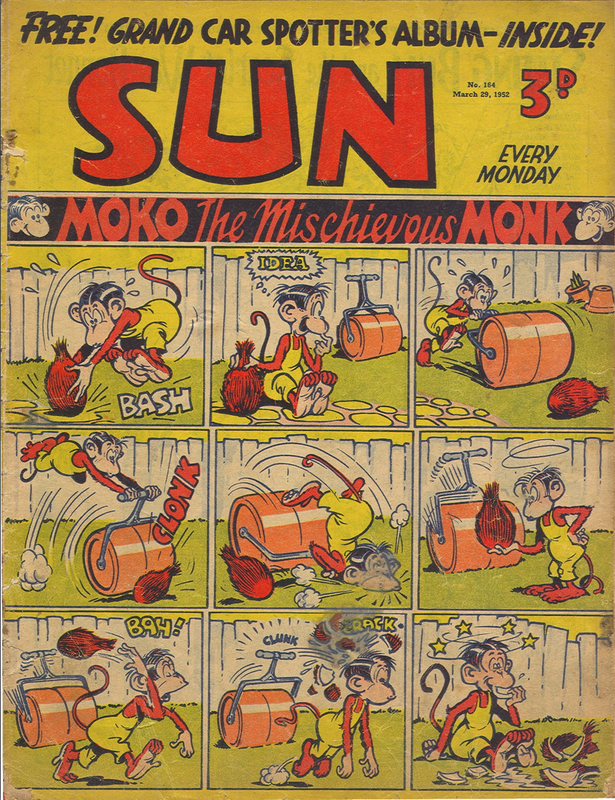 He was replaced all too soon though by Moko: The Mischievous Monkey, who appeared in full colour! 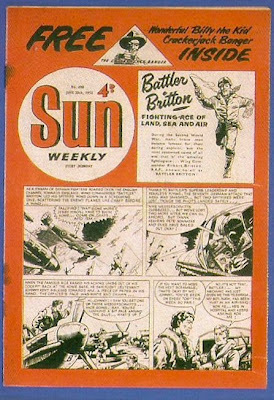 This version was the first time Sun had ever had a full colour cover. 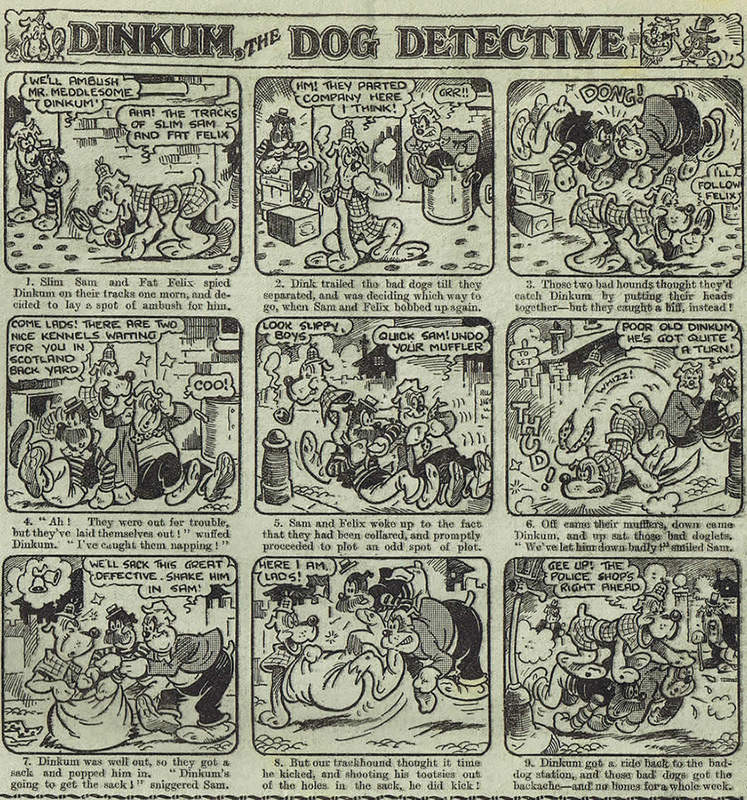 Below is the cover to #164, one of Moko's earliest appearances (but not his first). Ollie still appeared on the cover though - the back cover. Except they made the back cover look like the front cover, which is a little confusing. This was sorted out by #165. 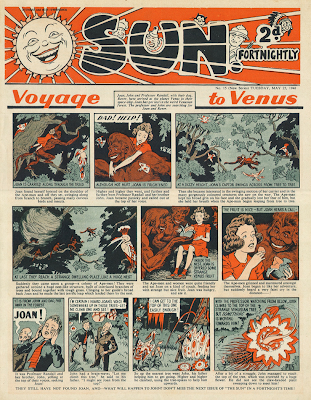 As we know, nothing lasted long on Sun and it quickly changed back to having an adventure strip on the cover! And, after changing to one full-page image of Billy the Kid, and then him on a red background, it stayed that way for five years until 1957. It then went down in quality to a black, white and red colour again, before folding for good. 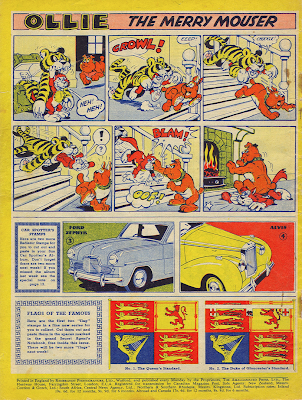 I don't have any of these later issues and the only images I could find were these, the photo from Ebay Australia and the scan from Denis Gifford's International Book Of Comics. 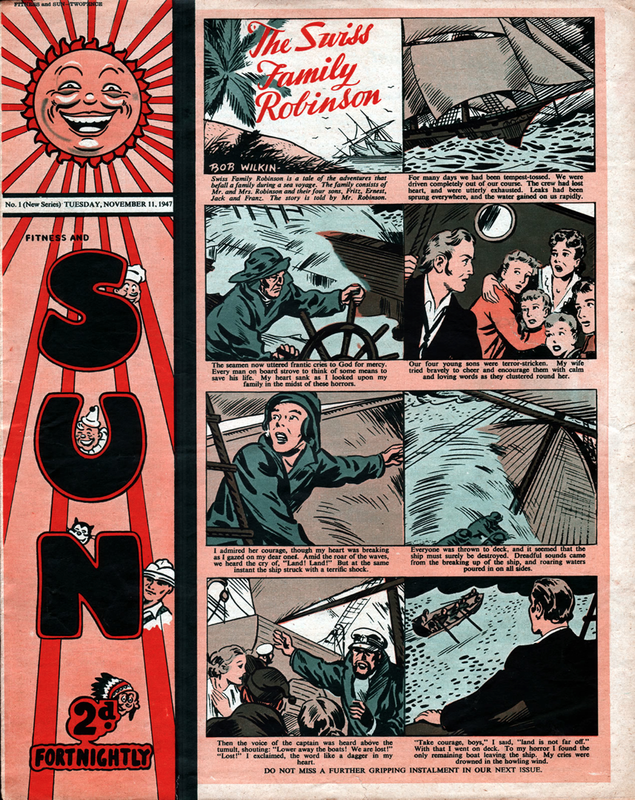 Today we take a journey through the 1940's and 1950's and take a look at the changing face of Sun comic. I mentioned in a post last week that Sun had undergone a lot of changes in its early years, before finally finding its audience. 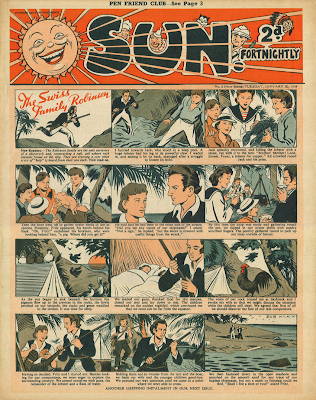 The front cover to the first issue (below) featured a Swiss Family Robinson strip by Bob Wilkin, an artist who illustrated many one-off comics in the 1940's. 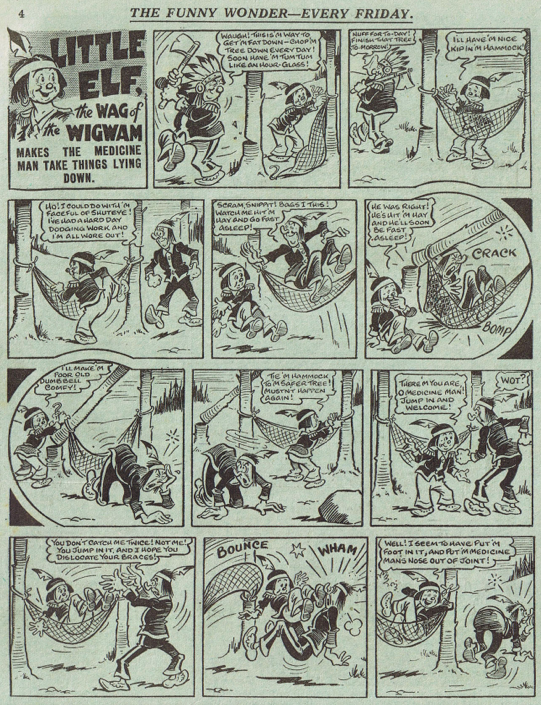 This strip proves he could also draw adventure strips, as well as his humour ones. 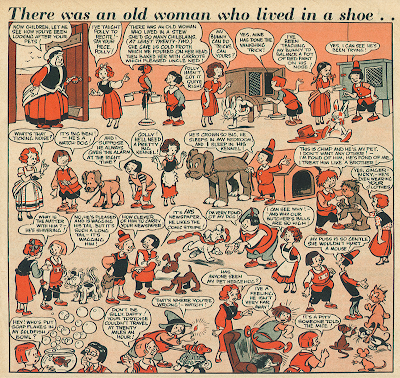 It cost two pennies and came out on 11th November 1947, with a new issue coming out every fortnight. 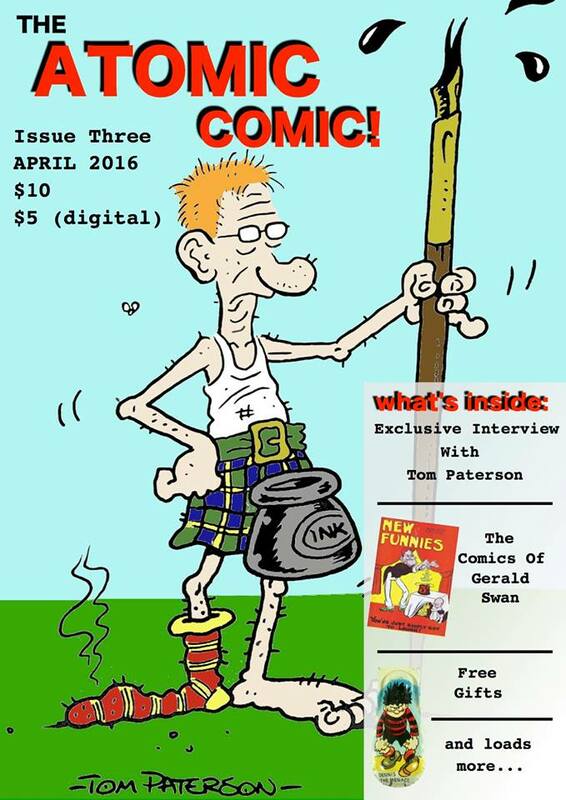 Issue six saw the first revamp to the cover, but it was nothing major. 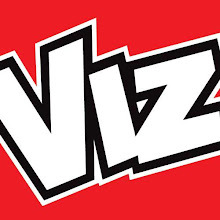 The logo had simply been redrawn and placed horizontally across the top, instead of vertically down the left-hand side. I think this change made the comic look far better. 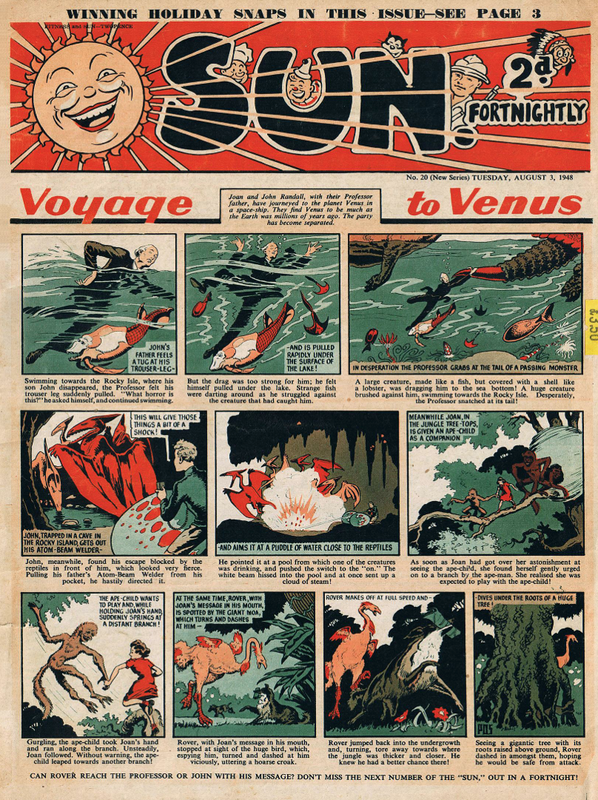 Soon The Swiss Family Robinson had ended, and was replaced by Voyage To Venus. I don't know who drew this strip, but it was always signed 'POS'. The logo soon changed to having a blue background, and by June 1948 was completely different. 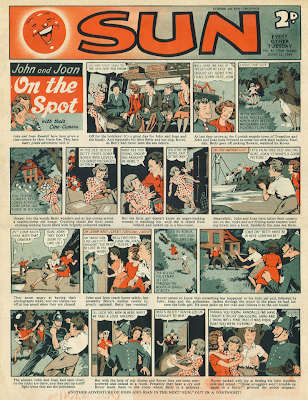 John and Joan: On the Spot had also taken over on the front cover. 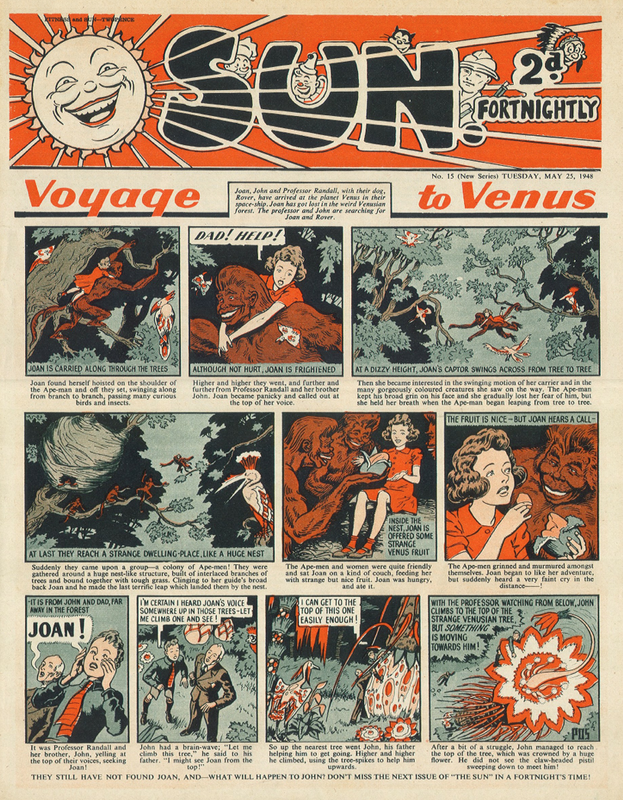 You may have noticed that they also appeared in Voyage To Venus! 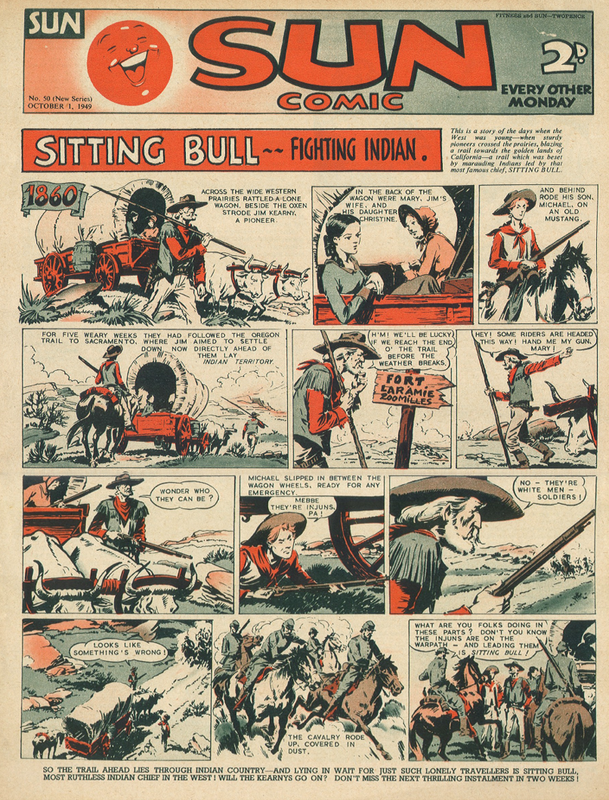 Joan and June were swiftly replaced on the cover by Sitting Bull - Fighting Indian. 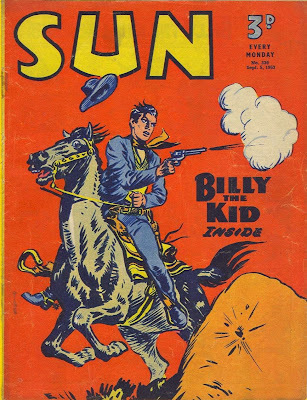 Sitting Bull had been inside Sun since 1959, and #50 (seen below) was the strip's first cover appearance. 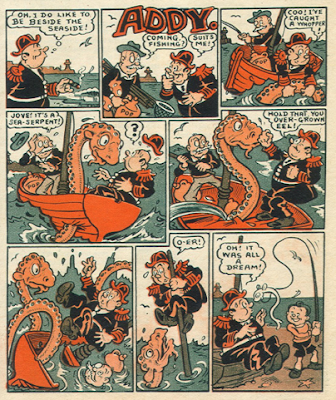 This was replaced by the cover's first humour strip - Young Joey: Always Late For School, illustrated by Hugh McNeill. He shared his cover spot with Professor Peanut. 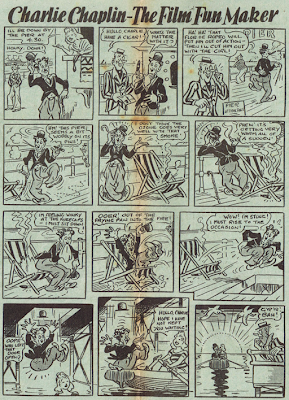 The stories of Young Joey always being late for school must have been very limited (although Slowcoach in Whizzer and Chips managed it for years, even using Joey's catchphrase - "Sorry I'm late, Sir, but I've got an excuse!") 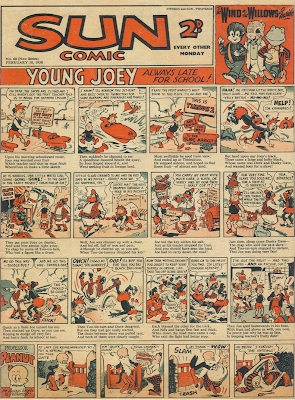 and Joey's strip was renamed Young Joey In Story Book Land. The title says it all really. 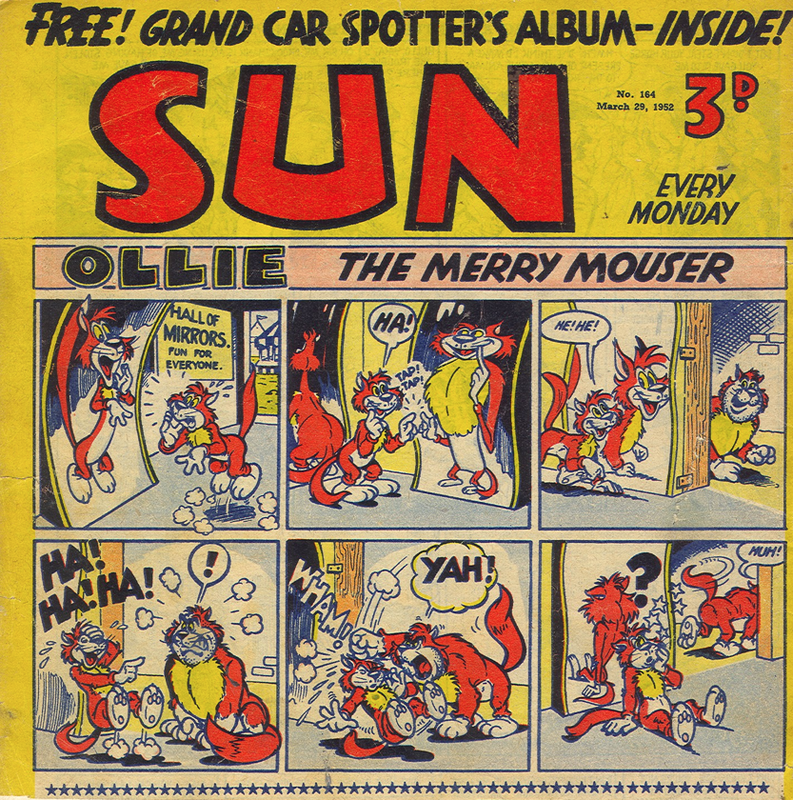 As you can see, it now says "Every Monday" on the cover, and by this point Sun had gained popularity and now came out every week instead of every fortnight. 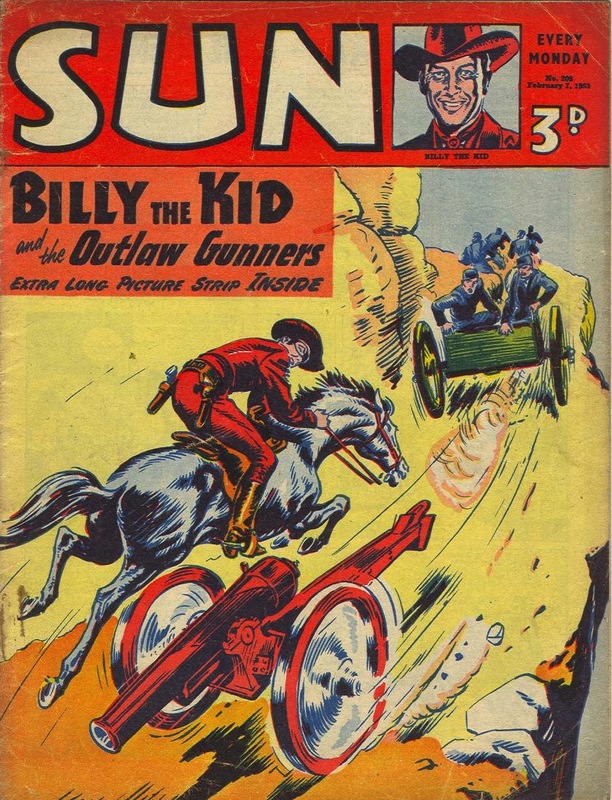 Joey had a good run on the cover but by the time Sun came to celebrating it's grand 100th issue he had been replaced by Alfred The Great. 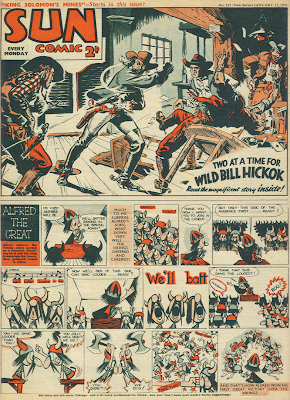 A large panel took up half the cover every week at this point, advertising the western adventure inside. 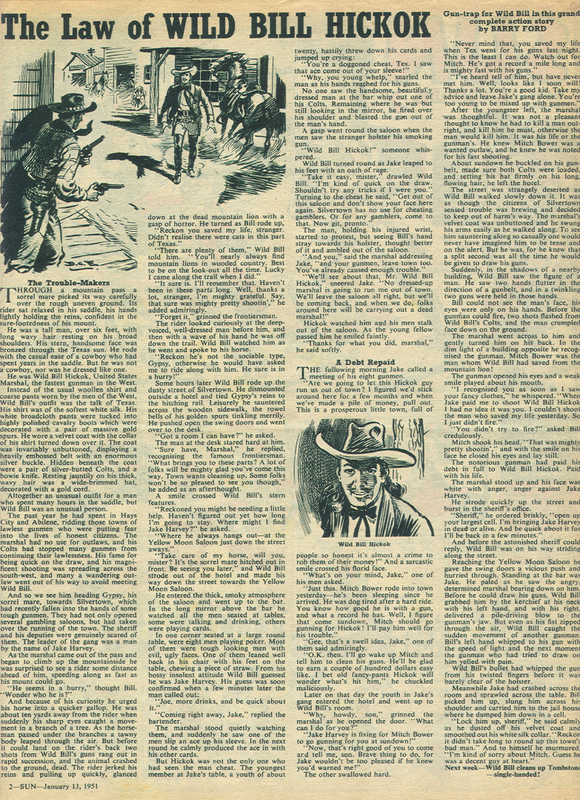 And here is the western story for this issue, entitled The Law of Wild Bill Hickok, a text story written by Barry Ford. 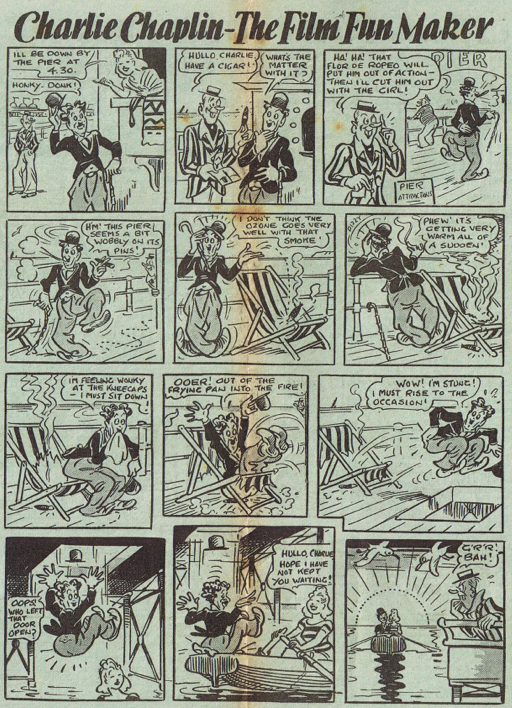 And going a bit off topic, here are a few strips from inside a couple of different issues we've seen so far. We've passed the halfway point in the tale of Sun's changing face, and I don't want this post to get too lengthy so I've decided to break it into two parts. I'll be posting the second part soon, so don't go anywhere! Eagle Weekly has become... Eagle Monthly! Once again, due to lack of time thanks to a big project I am working on, I bring you a short post today, but hopefully it will be of interest to most of you. As I suspect you all know, Eagle was originally launched in 1950 with immediate sales of close to 1,000,000 copies per week! In the 1960's it quickly went downhill when the comic was sold to Fleetway, and as a result it folded in 1969. 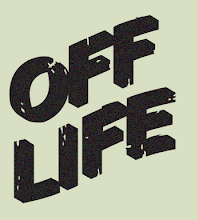 Then, in 1982, it was relaunched, with a new modern look in hope to appeal to the next generation. 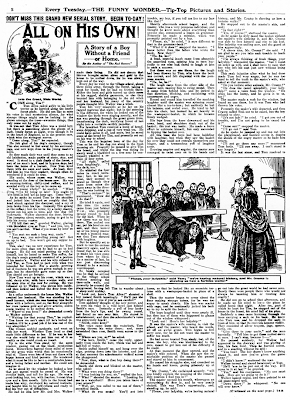 After almost nine years in this new format, it was changed from weekly to monthly. 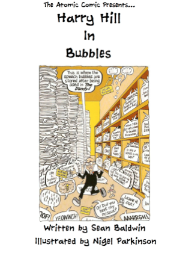 It boosted its page count to 68 pages and cost 95p, but it couldn't have helped the already falling sales. It folded for good in 1994. 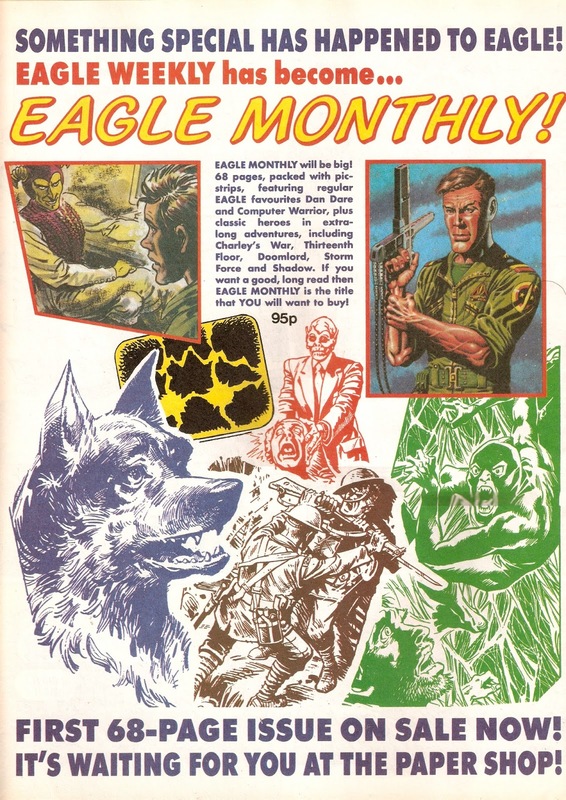 Below is an advertisement for the first issue of Eagle Monthly, from the Buster dated 13th April 1991. 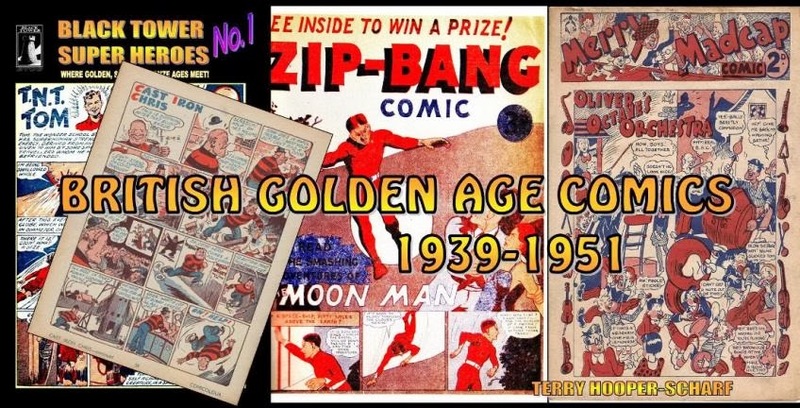 I'll be taking the comics time machine back to the 1940's and '50's soon, so stay tuned! 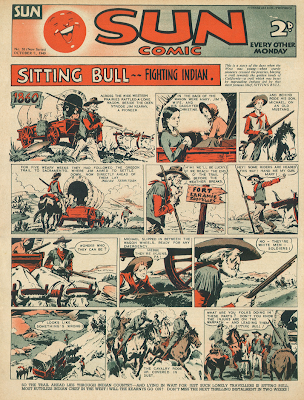 Do you want to read some British comics from the Golden Age? Of course you do, and thanks to Terry Hooper-Scharf you can! 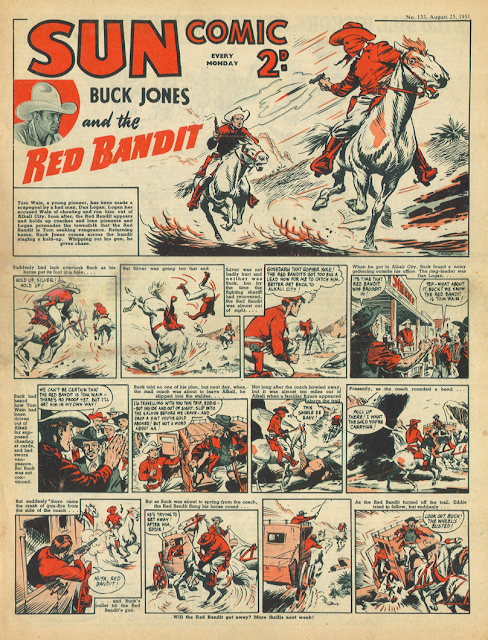 His blog, entitled 'British Golden Age Comics 1939 - 1951', is regularly updated with many pages from different comics from those years! 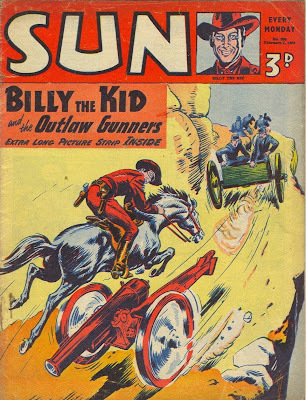 Personally, I'd expand the Golden Age of British comics to 1930 - 1951, but that's just my opinion. "Combining volumes 1 - 6 of the BT Golden Age British Comics Collections (minus adverts) this is the ultimate for any Golden Age collector or historian or just plain comic lover. 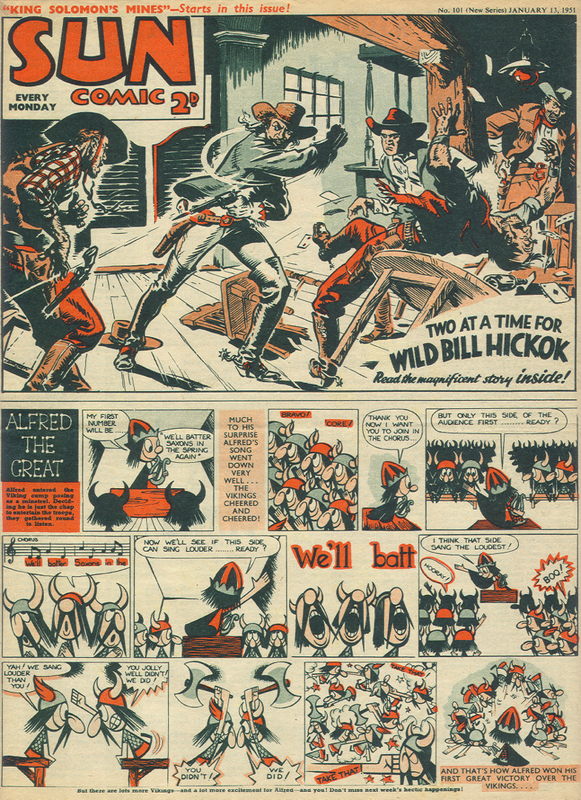 Features Ace Hart, TNT Tom, Electrogirl, Wonderman, The Phantom Rider, Captain Comet, Acro Maid, Phantom Maid, Dene Vernon, The Iron Boy, The Boy Fish, Professor Atom and MANY others!" You can read a preview of the book and buy it by clicking the link below. It costs $32.95 (in USD), and that includes worldwide postage. 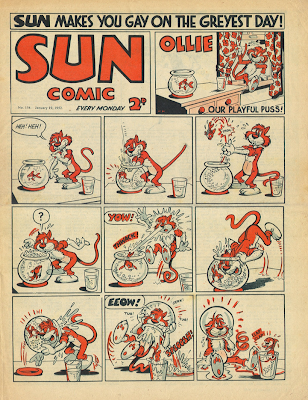 Today we head back to 1951, and take a look at the 133rd issue of Sun Comic. Sun had been launched in 1947, and it now cost two pennies, but its glory days had long since passed. 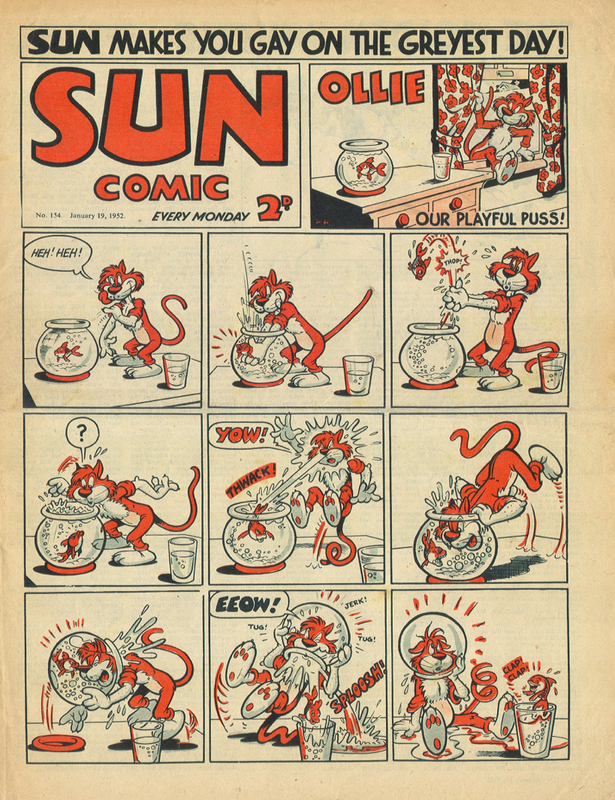 It was obvious by the number of revamps Sun went through that it wasn't selling. It had started out with The Swiss Family Robinson on the front cover, and then Voyage to Venus replaced it when the story finished. 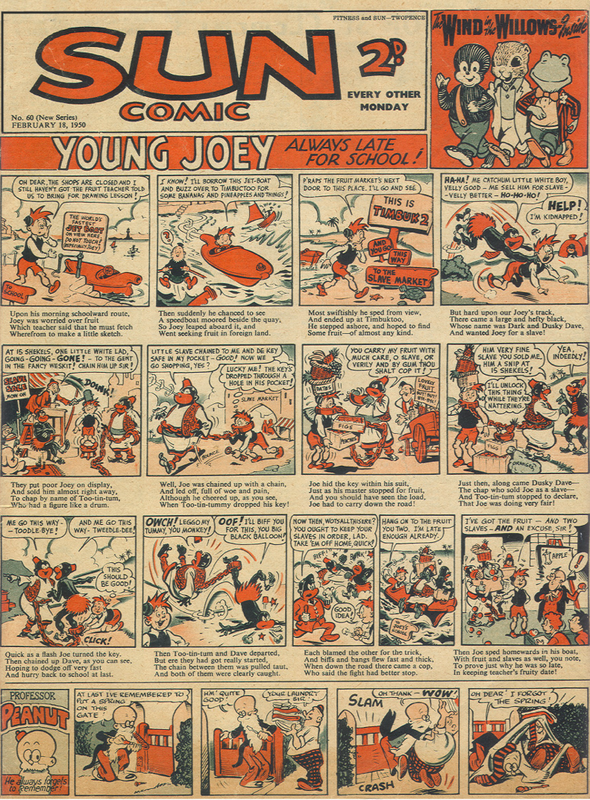 I won't list every front cover character, but by issue #60 a humour strip character called Young Joey was on the front cover. 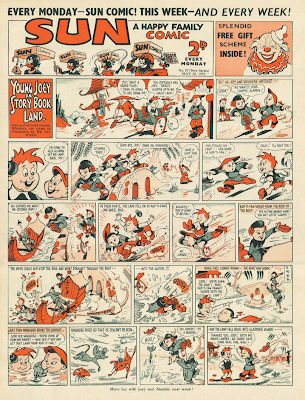 This soon became Young Joey in Story Book Land, where Joey was seen having adventures in various famous tales. He was replaced on the cover by another adventure strip soon, though. 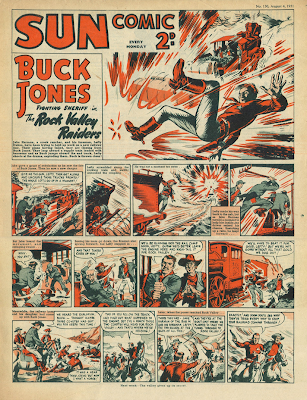 The front cover of this issue featured Buck Jones in an exciting serial entitled Buck Jones and the Red Bandit. 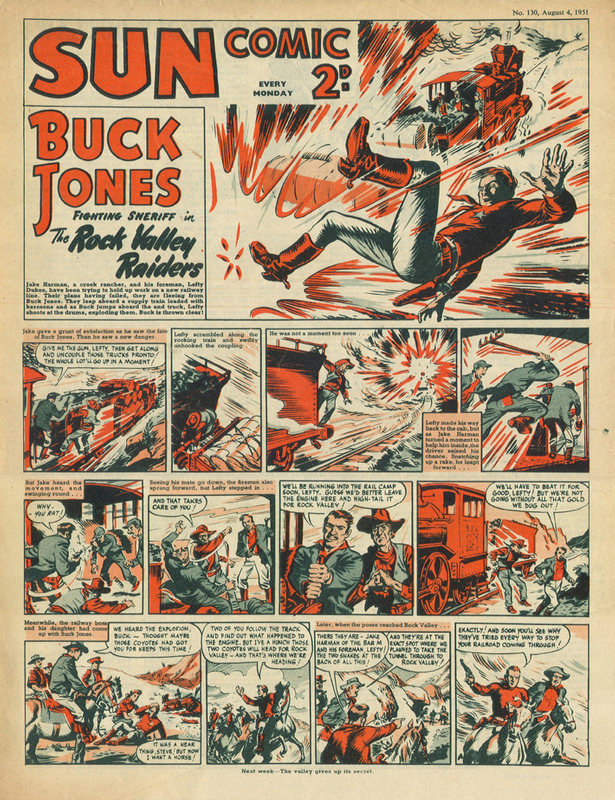 Buck wouldn't last long on the cover either, soon to be replaced by Ollie: Our Playful Puss. 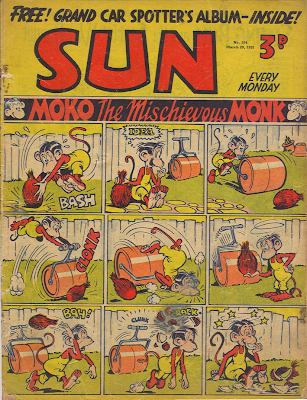 Ollie was swiftly replaced by Moko The Mischievous Monk. The comic soon went under yet another revamp, with a new logo and another adventure strip, this time Billy the Kid, on the cover. 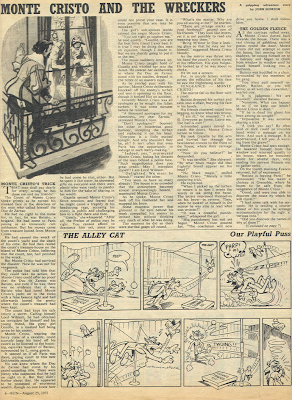 By the end of its run it was dubbed as "The Adventure Picture-Paper", containing no humour strips and completely abandoning its origins. 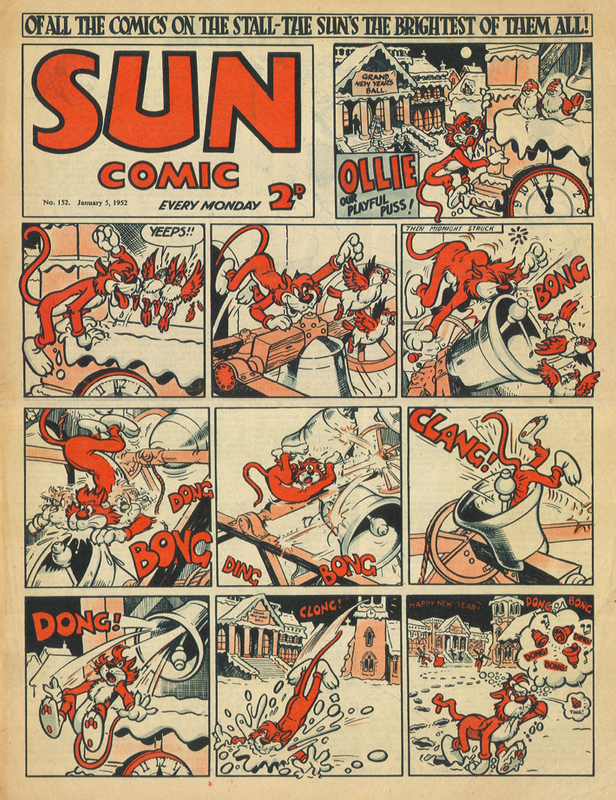 Each new incarnation of Sun was completely different to the previous one, but I'm sure that if it hadn't gone through all of it's changes Sun wouldn't have lasted even half the length it did. Before I start rambling on too much I'd better move on to the contents. 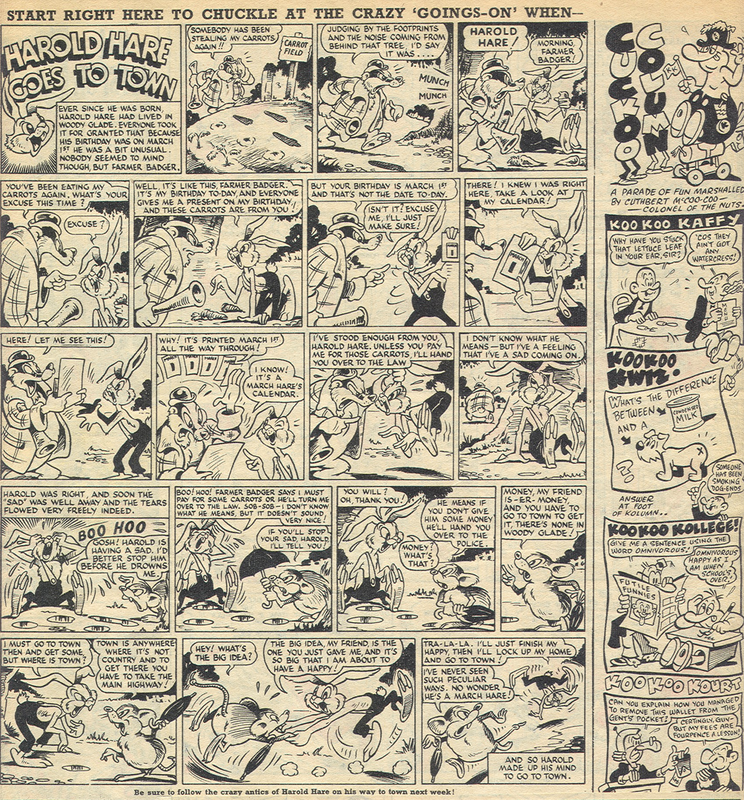 Here we see a strip entitled Harold Hare Goes To Town about the ever-popular Harold Hare by the brilliant Harry Hargreaves, but I'm sure Cuckoo Column on the right hand side will be of just as much interest to readers here, as it was drawn by the late comics historian Denis Gifford. 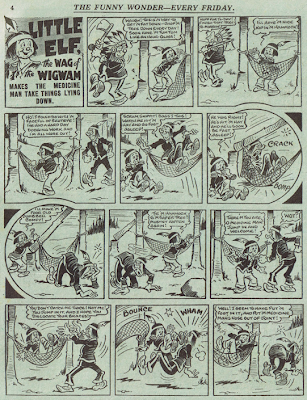 Cuckoo Column would return under the name Kukoo Klub in the first issue of Whizzer and Chips in 1969, and continue there until 1973. This was followed by Jolly Wally And His Wonder Horse Trix. I'm unsure of the artist, I would say E. H. Banger but it doesn't all look quite right to be him. 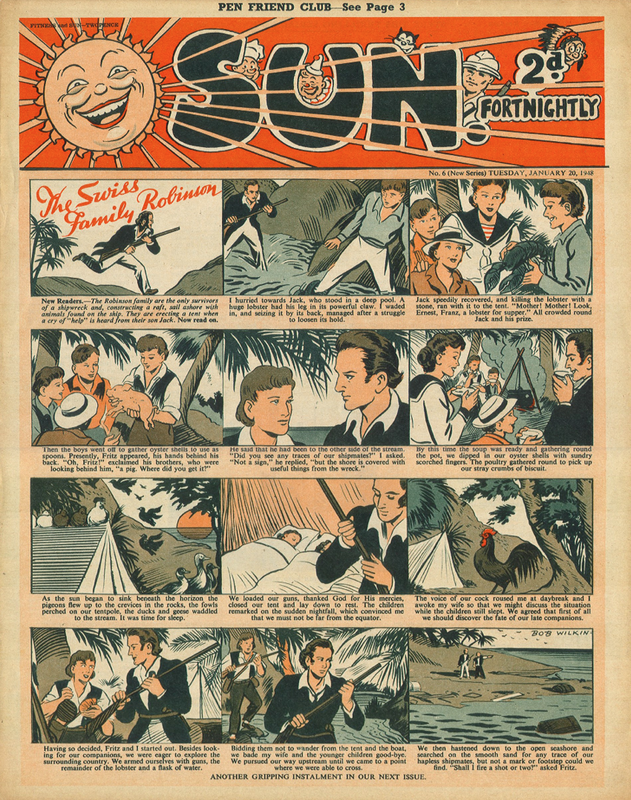 There were several text stories in Sun as well. Here is Monte Cristo And The Wreckers, written by John Morton. In the bottom right corner is The Alley Cat: Our Playful Puss. 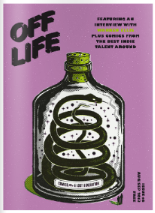 This is just a renamed version of Ollie: Our Playful Puss who appeared on the cover as I mentioned above; apart from the name everything is exactly the same. And finally, here is Highway Days. 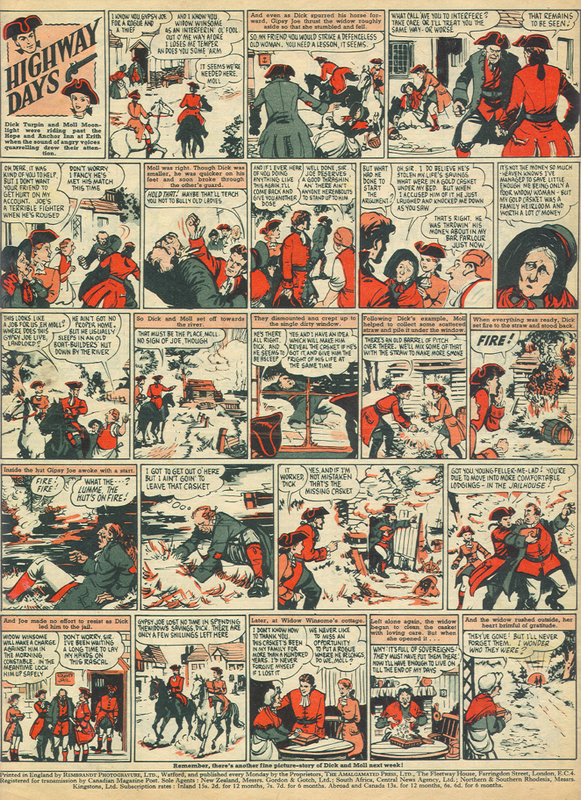 Again, I'm unsure who the artist was, but whoever it is, they managed to pack a whopping 23 panels onto a page, each one of them in great detail! 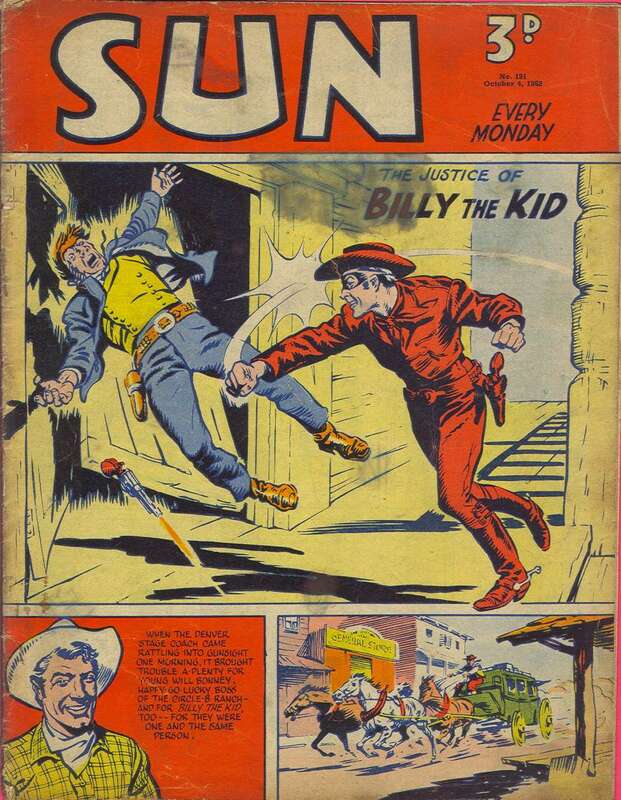 Luckily, Sun Comic found it's audience in the end, and once Billy the Kid had taken over the cover in late 1952 The Sun finally stopped revamping, with the style remaining the same all the way until it folded in October 1959. I've been very busy later doing some writing and drawing. 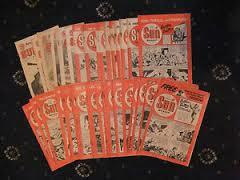 Although I shan't say what just yet, I will say it is comics related! 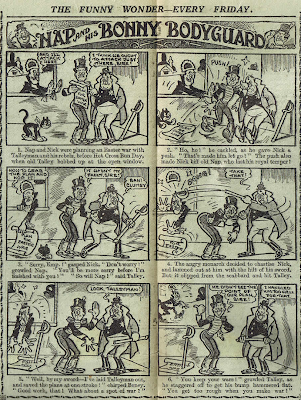 Anyway, I've taken a very quick break from it to write a short post about The Beano and The Phoenix. 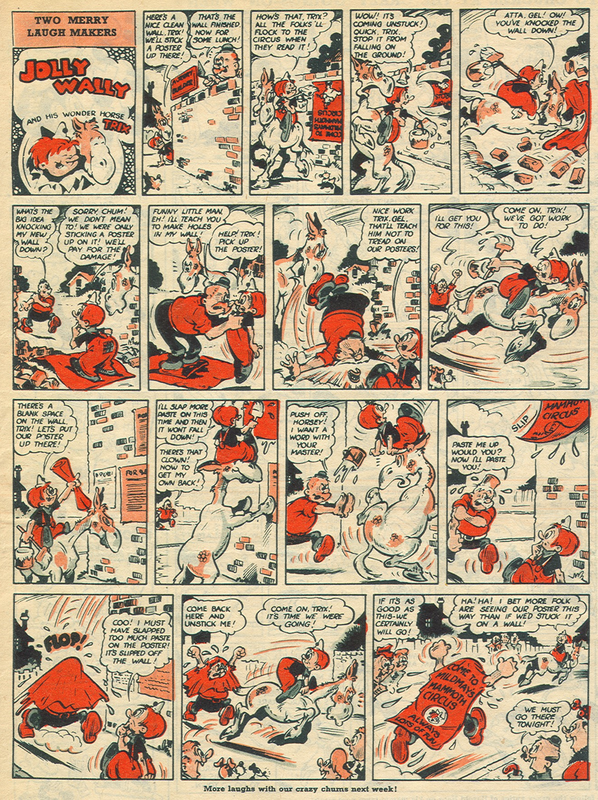 I'm still getting used to The Beano's dramatic changes. I was really enjoying the revamp it went through last year and these changes are all too sudden! Alexander Matthew's new look Ball Boy is a treat, and the latest issue also features Wallace and Gromit, who I believed moved over from the BeanoMAX. In The Phoenix, things continue as normal. Zara from Zara's Crown continues in a new adventure serial called Zara's Masterpiece, and an excellent new Haggis and Quail story also features. 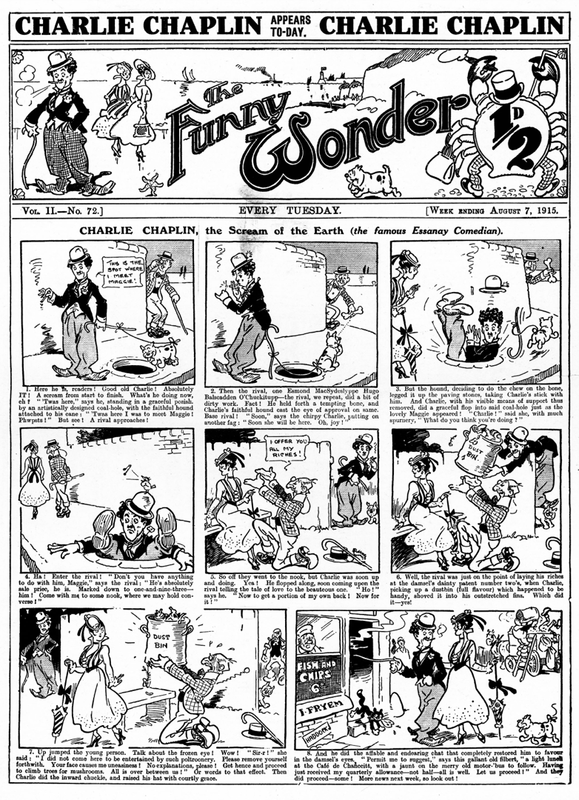 It's not often I head back to comics pre-1950 on this blog, but today I'll be showing you some pages from The Funny Wonder, a comic which ran for two series from 1892 - 1901 and 1914 - 1942 (and it continued from then on under the name Wonder). I'll be showing you some pages from the second run. 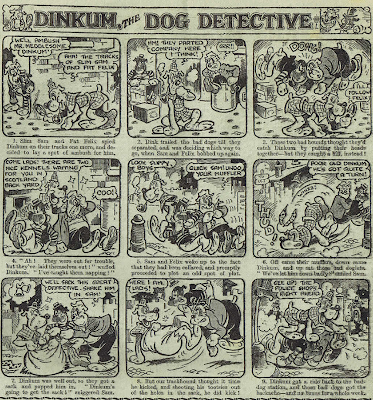 The first issue I'll be showing comes from 1915, early in the run for the second series. 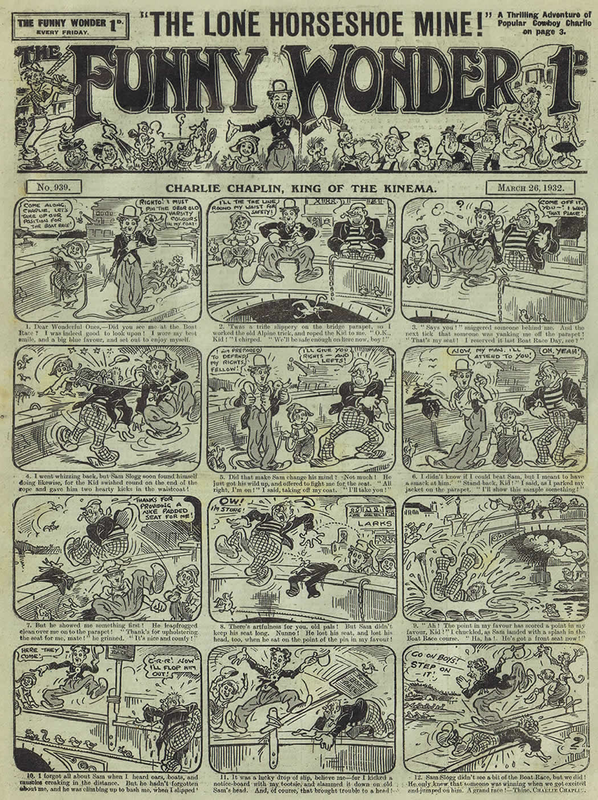 As you can see, the cover star was Charlie Chaplin and I think this was his first appearance in the comic. 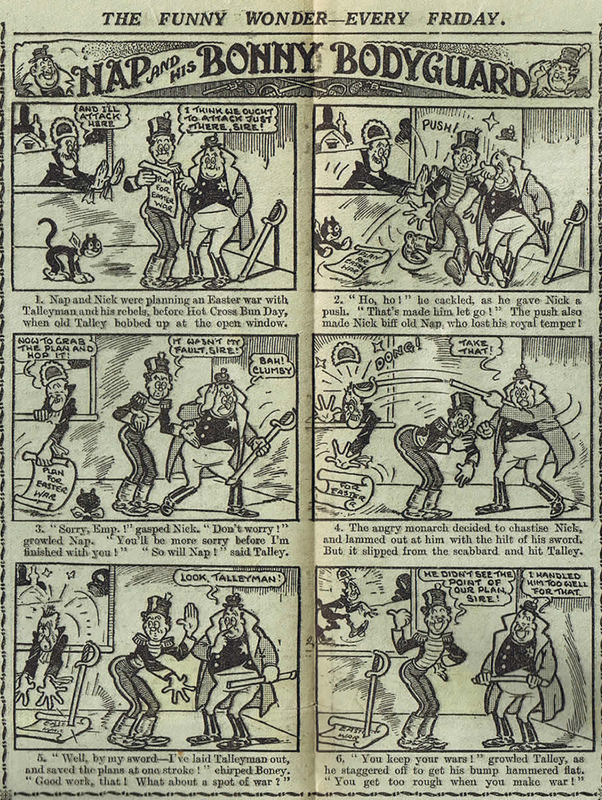 Since the 75th Birthday issue of The Beano celebrities have taken over the comic. Many are unhappy about this change, stating "celebrities don't belong in comics". Whereas I agree there was a few too many, this example below should prove that they've always been appearing in them - I for one find this particular episode hilarious! 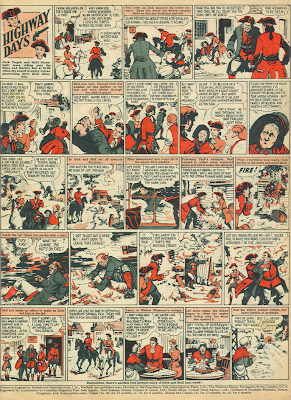 This particular comic was part of Denis Gifford's 'Six Comics Of World War One' that was released in 1972. As always, click on the image to view in full size. 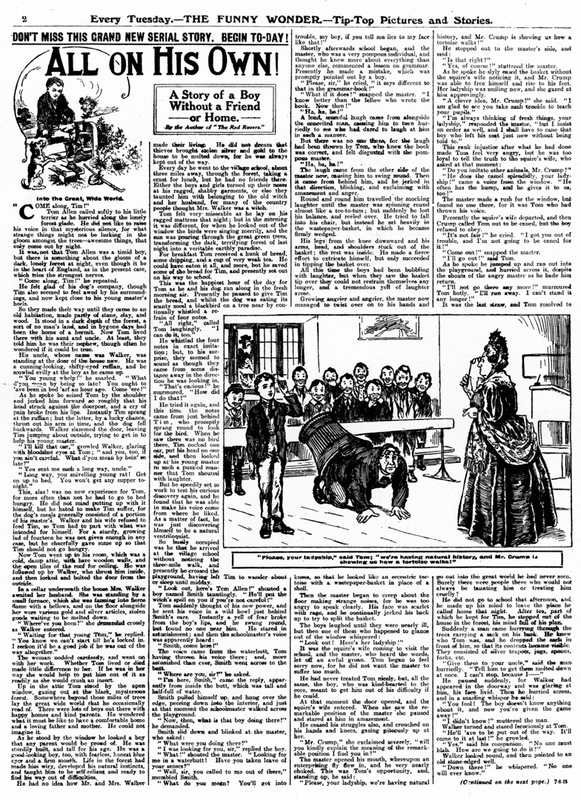 Moving inside and the majority of the contents is made up of text. 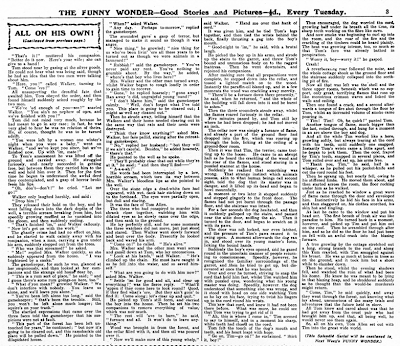 One such story is All On His Own, which began in this issue and was spread over one and a half pages. 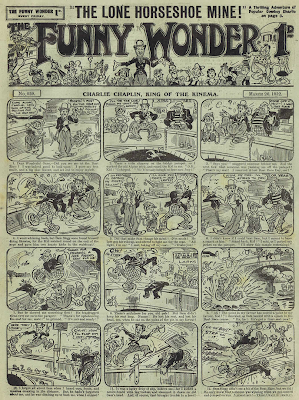 Move forwards to 1932 and Charlie is still the star of the cover, which is hardly surprising seeing how popular his films were and how popular they are now! I won't be showing any more text stories but I will show some small humour strips from the center spread. 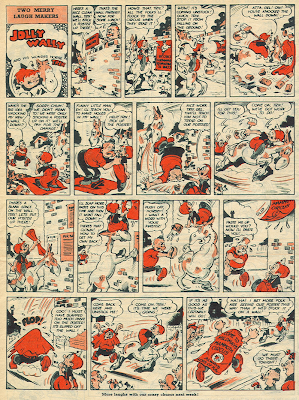 Many comics had their center spreads filled with comic strips, and the front and back covers as well, with the rest of the comic filled with text. 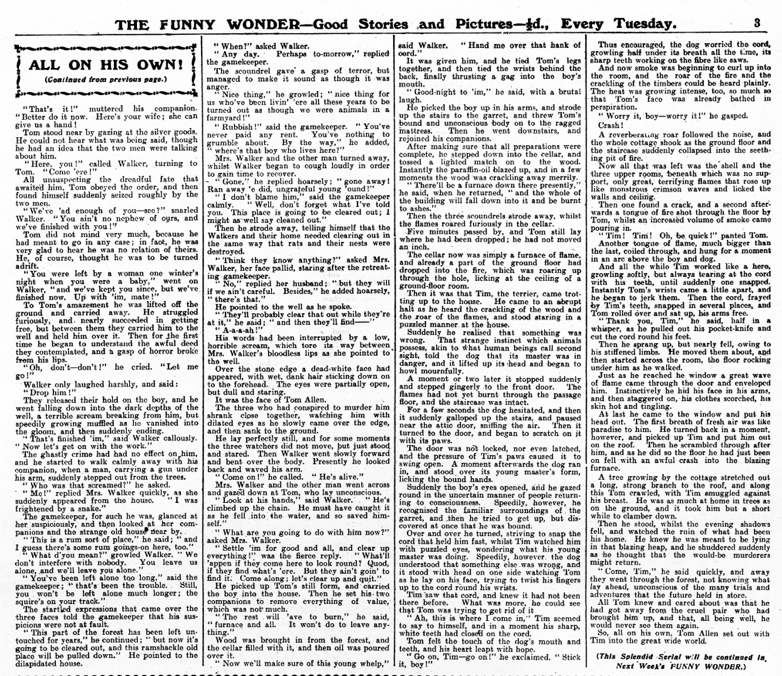 A classic layout that The Funny Wonder also followed. Finally, we come forwards to 1939. 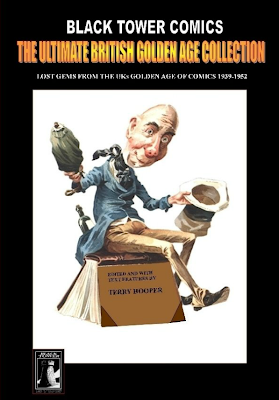 As you can see, Charlie Chaplin had been replaced on the cover by a fat 'n thin duo who go by the names of Pitch and Toss. 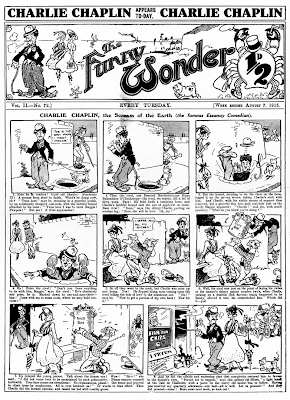 Charlie still had his strip, but it was small and was hidden amongst others on the center spread. 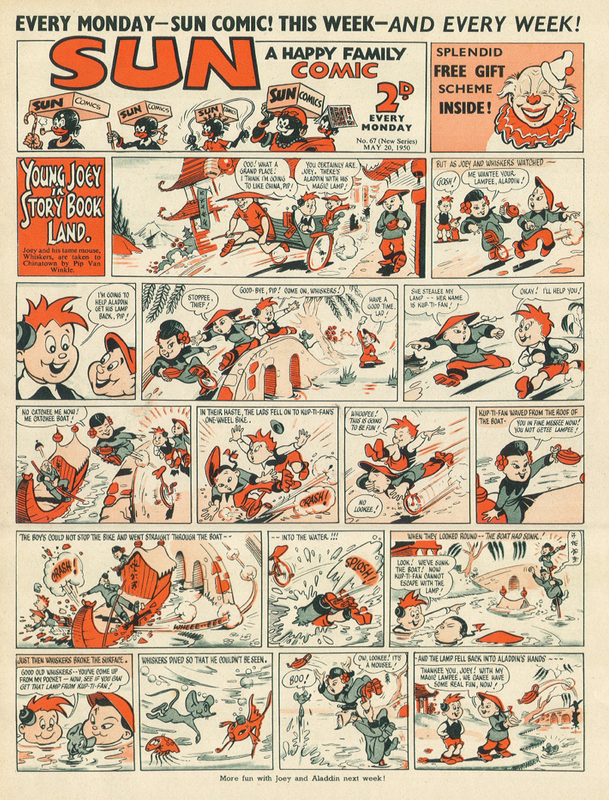 Also to be found on the center pages was Little Elf - a strip remarkably similar to Little Plum. I've reached the end of this blog post all-too-soon. 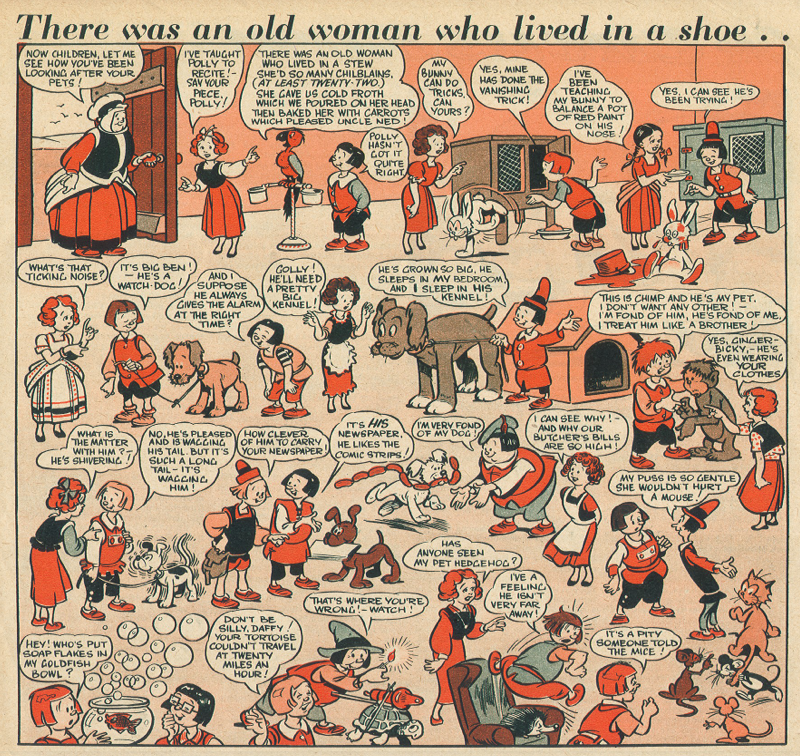 I hope you've enjoyed these old comic strips, and hopefully I'll return to this era in the not too distant future. As I mentioned in yesterday's post today I have another interesting item from one of the greats. 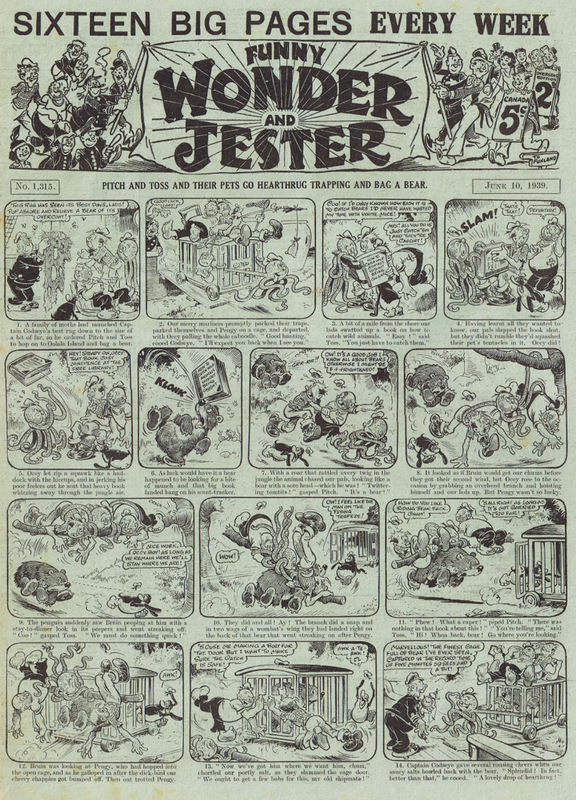 This one comes from Leo Baxendale and was produced in the 1970's to go with his Willy the Kid books. I am of course, talking about the Willy the Kid badges, and I'm sure a few of you will have seen them at some point, or maybe you're lucky enough to own them! As far as I'm aware there were three badges, one for each of the Willy the Kid books and were given out to kids who sent in the tokens (found inside the books) to apply for them. 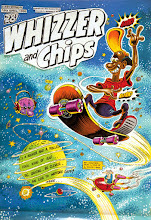 There was one more Willy the Kid book produced about 10 years ago, but didn't feature any new material. Instead it was reproductions of artwork printed in A3 format so it was close to its original size, and cost over £100. As you can probably guess, no badge was produced for that. Faction No. 2 Ready To Preorder NOW! 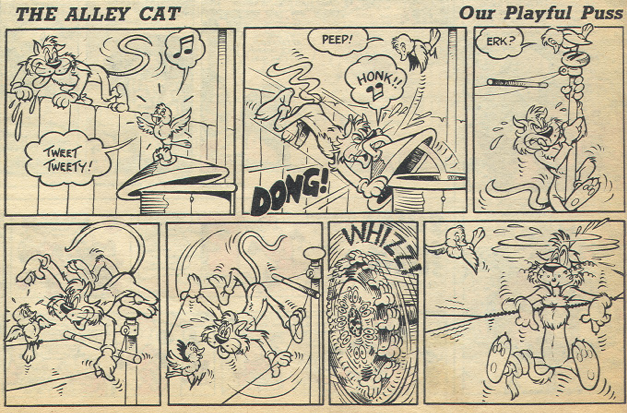 This Week In... 1974 - Whoopee!